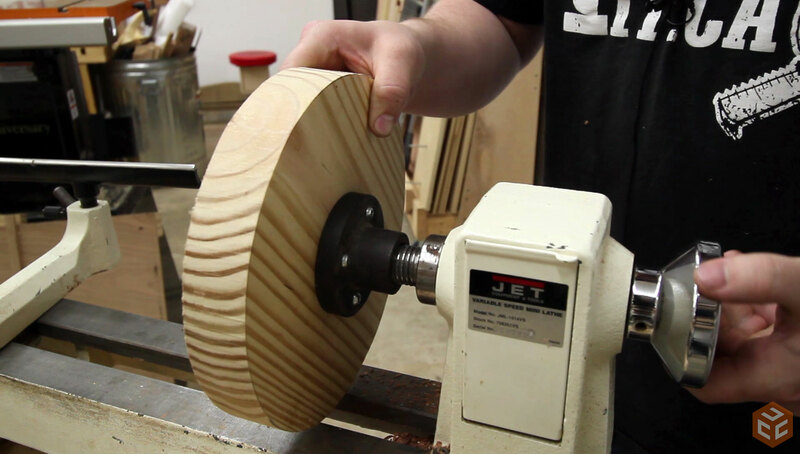 Get A Lathe And Have Fun! 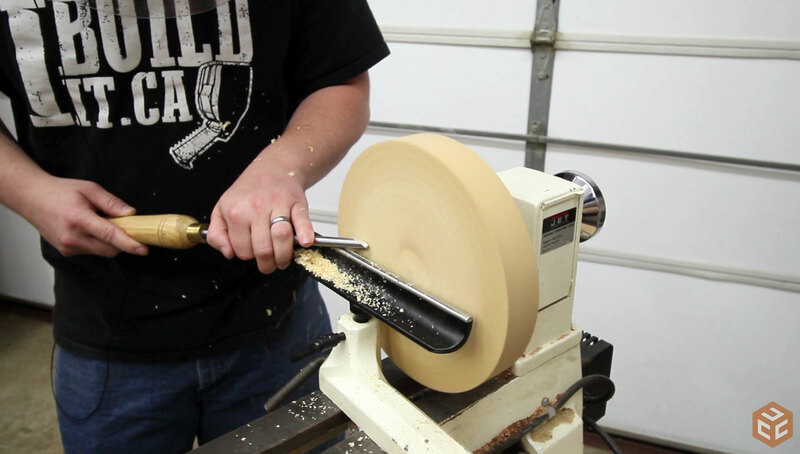 If you’ve been hanging around for any length of time you’ve probably heard me talk about getting a wood lathe. I’ve wanted one for quite some time but never ventured down the path of getting one for one reason or another. Fast forward to April 2016 and I got a lathe. It’s a Jet variable speed mini lathe. I didn’t purchase it though. It was a gift from a friend of mine, Kevin Miller. He provided me with the lathe, some accessories, and some turning tools. Hopefully one day I’ll be in a position to pay the favor forward and pass it along to someone else. In the mean time I’m having a blast making things and learning a new skill. Admittedly, I’m new to woodturning so I’m not really in a good position to teach or instruct but on the flip side the fact that I’ve been able to pick up the concept pretty quickly and actually make useful items is an example of how easy woodturning can be. 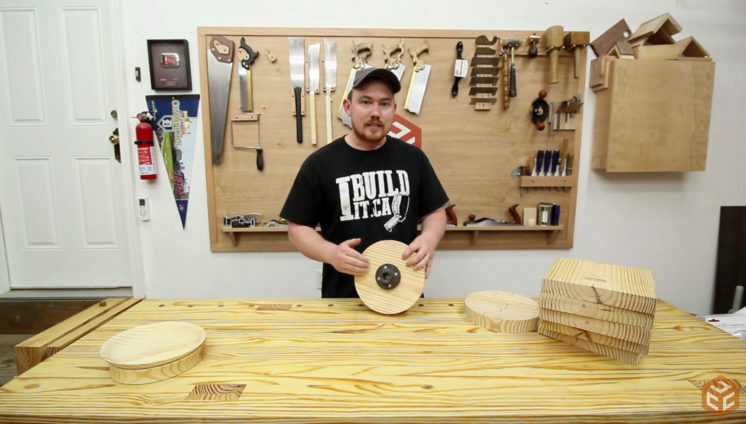 Today I’m going walk you through one of my practice projects that is inexpensive to make, a good learning project, and easy to do. For material I’m using inexpensive 2×10 pine from the home center. 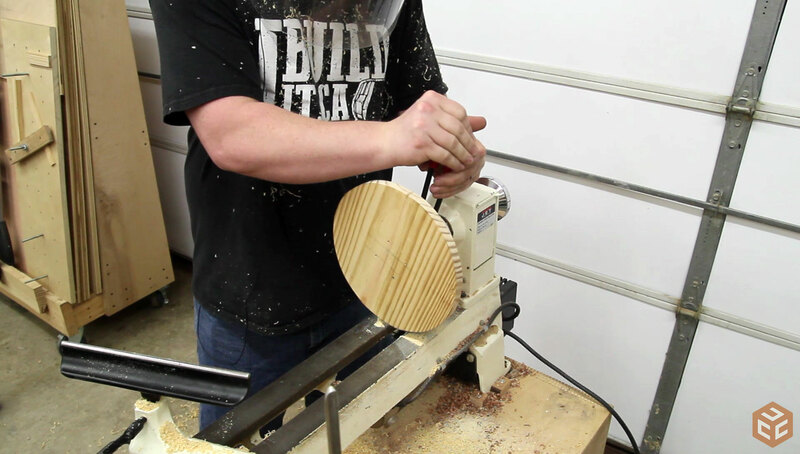 This one 8′ board that I used yielded 7 turning blanks that are 9.25” x 9.25”. 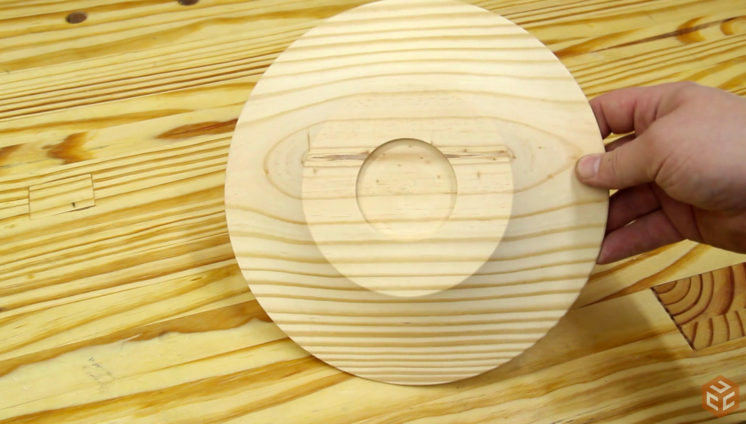 After the center is found a compass is used to draw the largest circle possible on the blanks and then the circle is cut out at the bandsaw. I’ll turn the bottom first so the face plate is secured to whatever side will eventually be the inside. If you are unaware, a face plate is a great way to get a firm grip on your work piece in situations where a chuck simply won’t work. It’s threaded onto the headstock. For the tool I’m using it’s best to set the tool rest slightly below center. 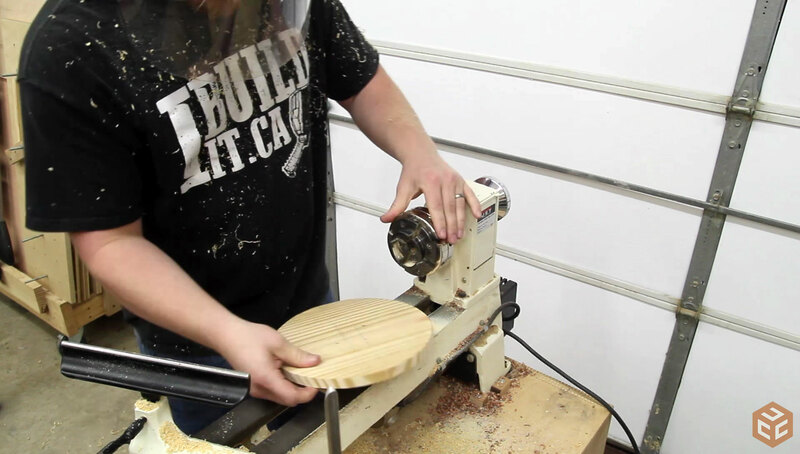 I’m using a small bowl gouge for this entire project. 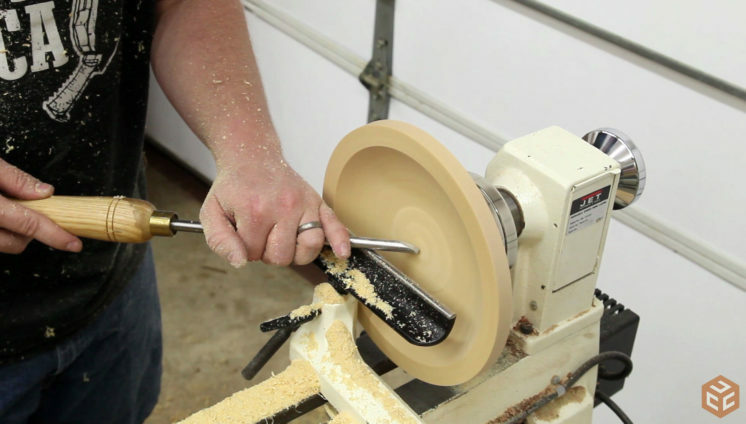 A 3/8” Woodstock bowl gouge with an Ellsworth grind to be exact. The center point and just a little bit of the forward edge will be doing all of the work for the majority of the cuts. But the beauty of this type of grind is that it forms longer wings to either side that can also be used for scraping or shear cutting. It’s important to note the direction of the bevel on the back side of the tool. I’ll get into that in just a bit. If the blank is too far out of balance it might be best to true it up on its circumference first. In this case it wasn’t bad so I skipped that step. It will be removed when the outside shaping takes place anyway. Instead, I started by using the bowl gouge wings to scrape the bottom face flat. A tenon or mortise needs to be cut into the material so that when the piece is reversed it can be mounted on a chuck for the interior material removal. I chose to make a mortise on this piece. To determine what size mortise is needed a set of calipers is used. With the calipers set to the diameter of the chuck jaws that I will be using and the lathe running I can lightly press in the left side of the calipers in a somewhat downward direction. This will form a circle to use as a guide. If the circle lines up with the other side of the calipers than the appropriate measurement was transferred. Actually removing material is the fun part. Let the chips fly! 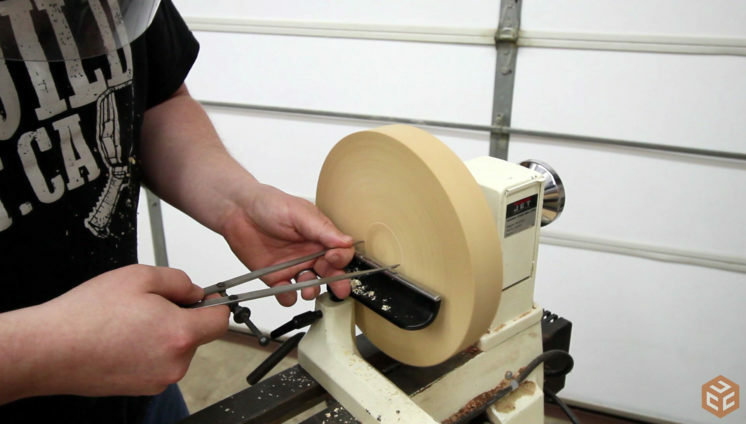 The bowl gouge has a flute that runs through it. This results in a high left and right side of the tool. 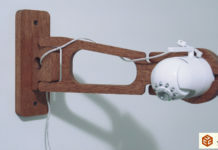 If you place a stick across those two high spots and rotate the tool so that the stick is horizontal than that is called “wide open” for the tool. 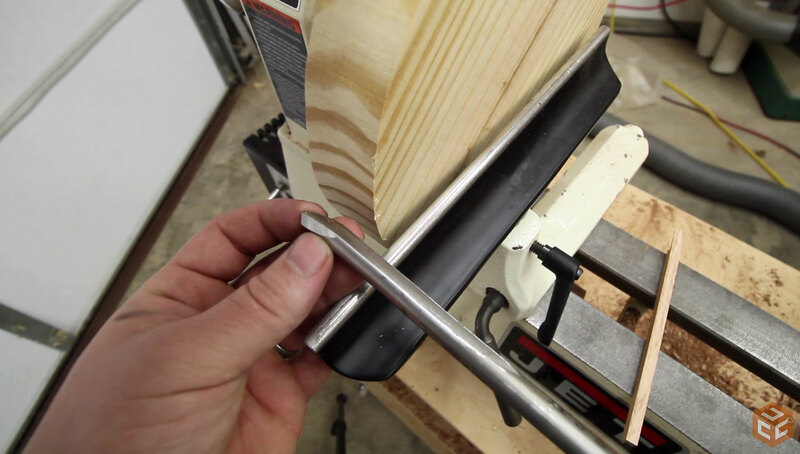 If the stick is vertical than that is called “closed” for the tool. Also keep in mind the bevel angle on the back side of the cutting edge. This determines the cutting direction. To start the cut I positioned the tool so that the bevel angle is directed into the material and the tool is in more of a closed orientation. 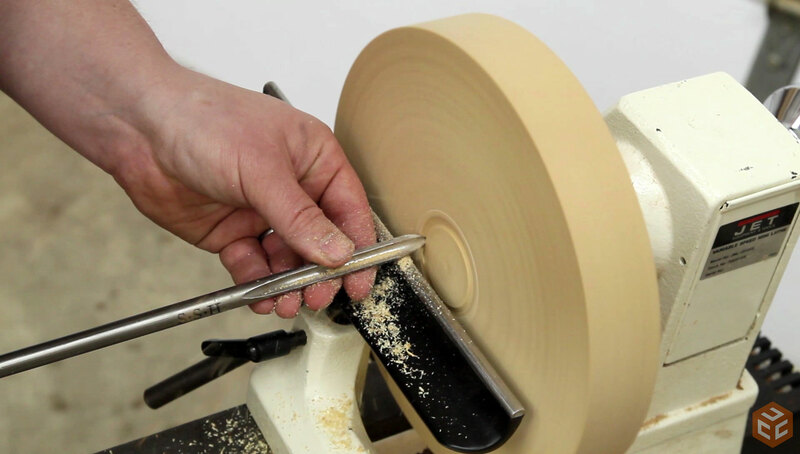 Once the tool removes a tiny bit there is space for the bevel to ride against and at that point the tool can be opened up to about 45 degrees to start removing a lot of material. Once the depth of cut has been established the back end of the tool can be rotated as needed to change the direction of cut for whatever angle that is needed. For the mortise I started near my scribed line and worked to the center. Then turned around and worked from the center to the scribed line. The depth is different depending on what chuck you are using but I was shooting for a .25” depth. Now the bottom shape can be established. 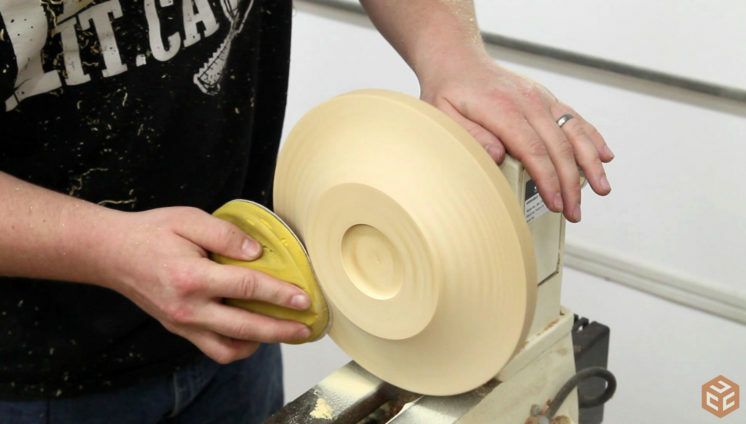 I’ve made a few of these practice platters with a Roman ogee bottom feature but decided to keep it simple for this and make a single concave curve for the bottom feature. Before flipping the material over a quick sanding makes the finishing process easier. This is just a pine practice piece so I only used 180 and 220 grit on my foam sanding pad. To reverse the piece the lathe the face plate can be removed from the material and the chuck can be installed onto the headstock. 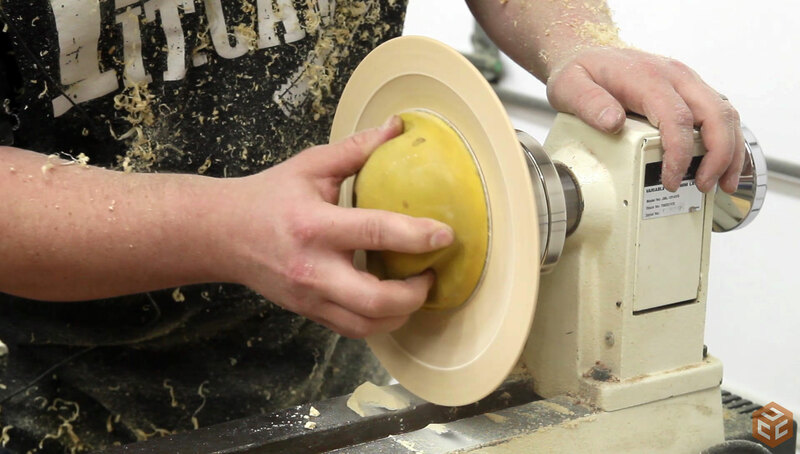 And the material can be mounted to the chuck via the previously created mortise. When working on the interior of the piece it will be beneficial to use a drill bit to drill a hole to the final depth you want to take the piece. That way when you get to the bottom of your drilled hole you know you have gone far enough. I forgot to do this on this project so I had to be careful and measure as I went to make sure I didn’t go too far. The process for using the tool is the same. I wasn’t as consistent with my final passes so I had to follow them up with a few scraping strokes to clean up the ridges. At this point the piece was shaped as I wanted but the exterior rim was a little bit too bulky looking. 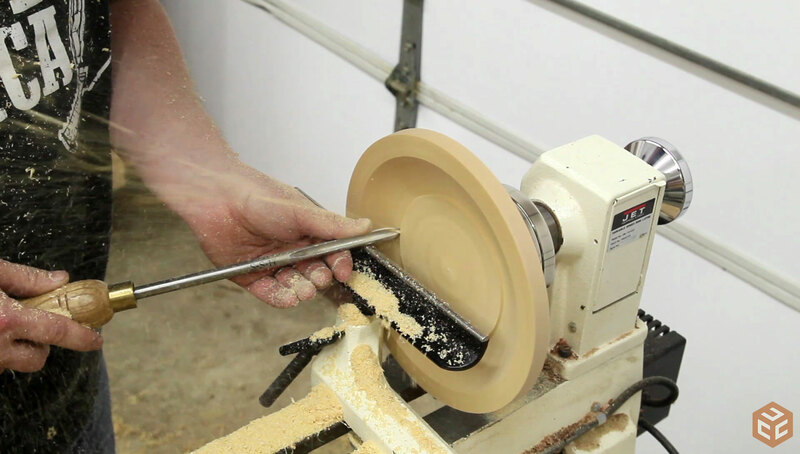 I used a scraping cut here as well to reduce the exterior rim thickness and make a flat ring along the outside. 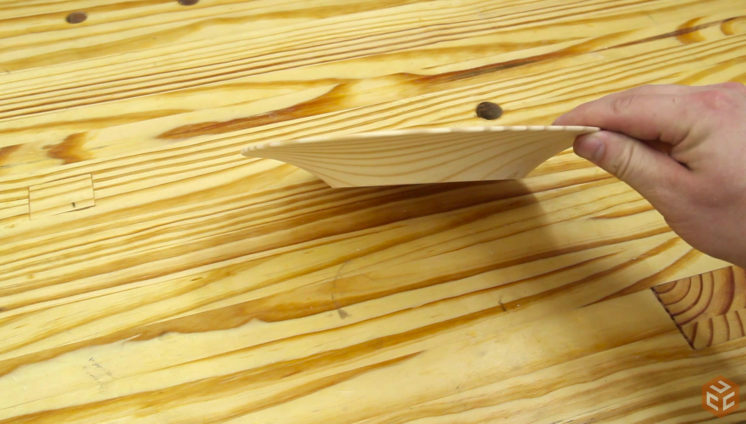 The final step is usually to apply a finish. I didn’t want to here though. It was just a practice piece and I was cutting cheap pine. So my final step was to sand to 220 just like the outside. The final piece turned out pretty nice. 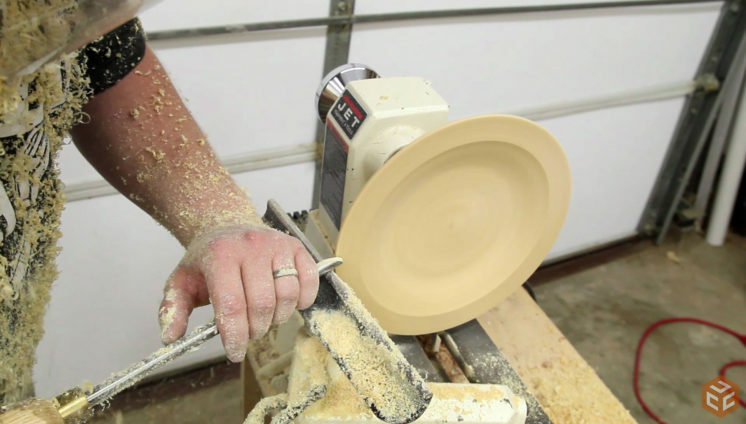 But this article and video isn’t necessarily about making a platter or using a bowl gouge. I mostly just want to encourage anyone reading this to give turning a try. If you don’t have a lathe try to get a hold of someone else who does and see if they will let you use it. 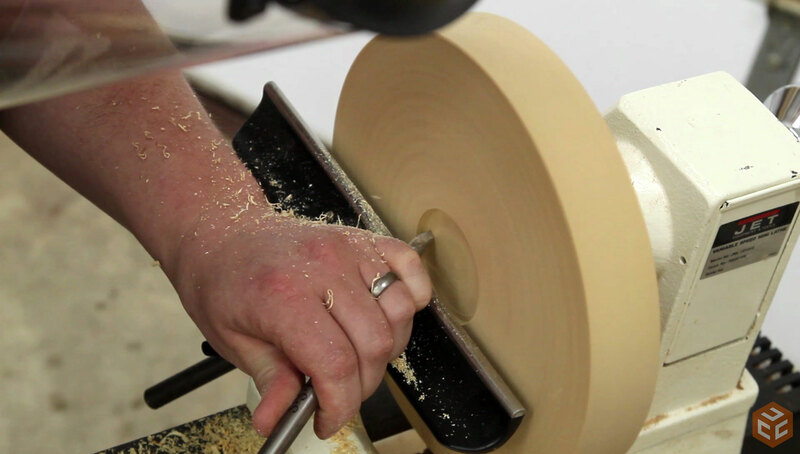 See if you have a local woodturning guild in your area. 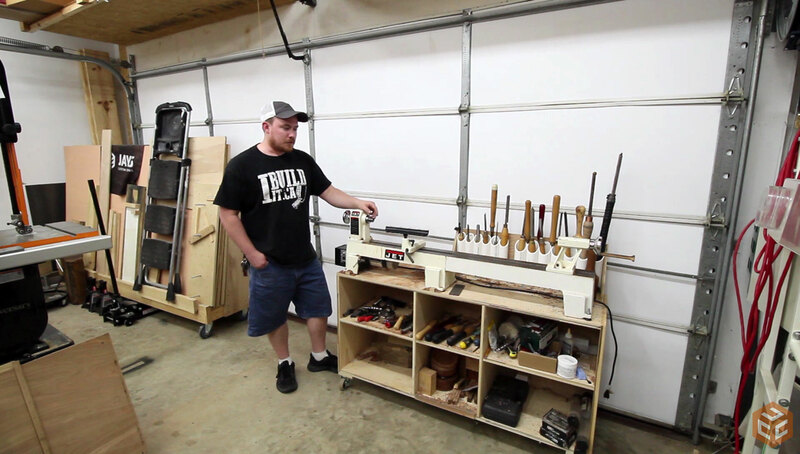 And if you were already on the fence about getting a lathe I encourage you to do so. 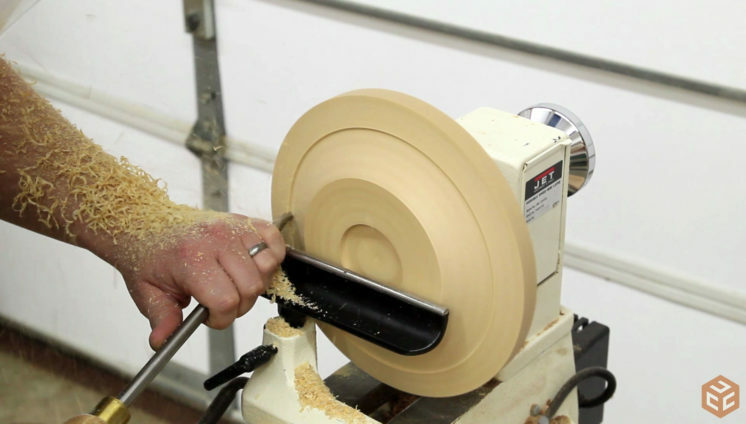 Whether you want to make complete projects on the lathe or just parts for projects woodturning is a LOT of fun. Check out the last minute of the video to see other turned projects I’ve made in the past 2 months just messing around. 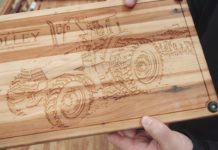 Very nice work Jay ! 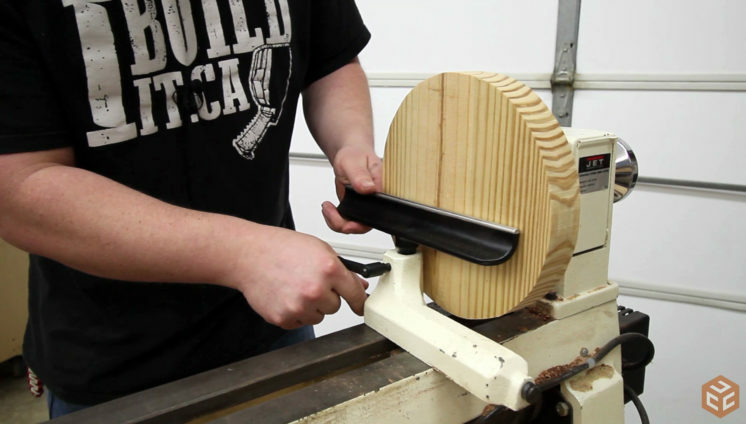 Practice makes perfect just like you did with you dovetails. Keep up the good work! 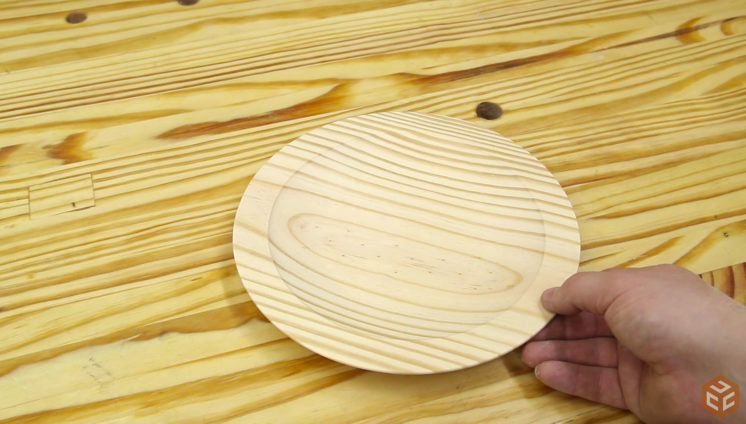 You do a lot of your work in yellow pine , you should start using some other woods . You can fined some good deals on craiglist I do. Great instruction, especially on proper tool use. My first lathe lessons were in high school shop class in 1957. It’s a tool I always gravitate to when I find myself wanting to fill time between ‘serious’ projects. It’s amazing how many things you can make with so-called ‘scraps’ or even material destined to be firewood. While living in New Mexico ‘firewood’ was often Pinion Pine and Mesquite. 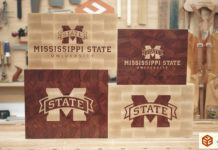 Now here in Arkansas, Oak, Ash, Walnut and Cedar are plentiful and inexpensive. As always, great instructions – concise and easy to follow. The only criticism is related to personal jewelry – watches, necklaces and rings. Don’t wear them when working on any wood working equipment especially when your hands are in such close proximity to a spinning mass. Soft skin and even bones don’t react well. Be safe to keep it being fun. Jay I know your in the early stages of turning we have all been there and lover the journey but just try gluing two and then three pieces of different colour wood and then turn them it will open a hole new world to your art, besides lamination get ride of a lot of your scrap wood and you wont believe the artistic items you can create. cheers from Australia.